Tough Mudder and Lidl are partnering together in 2019 to bring you “Lidl Mudder”, an even more epic version of the famous Mini Mudder kids obstacle course. 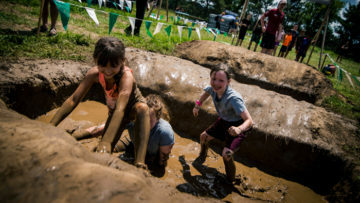 Designed for fun and based on teamwork and adventure, Lidl Mudder is a 1-mile course consisting of 4 laps jam packed full of obstacles to give kids the chance to work as a team and get a little muddy. Lidl Mudders will be swinging from monkey rings, dodging through a ‘laser’ maze and even tackling their own mini version of Tough Mudder’s famous Everest obstacle at events up and down the UK in 2019. Lidl Mudders must be between the ages of 5-12 and at least 1.1 metres tall to participate. Lidl Mudders must be accompanied by an adult or guardian with a valid spectator ticket, purchased online for £10 plus fees, or £20 on event day. There is also a fee for parking on the day of the event. To read more and sign-up, please click here!